From birth to about six months of age, breast milk or high quality baby formula are all that babies need to grow and develop in a healthy manner. At about six months, most paediatricians recommend that parents begin to add variety into their babies' diets by introducing solid foods. Transitioning from an all liquid diet to a diet that is varied and rich in vital nutrients takes a bit of time and most paediatricians suggest that parents begin with the simplest of foods, typically a single grain rice cereal specifically designed for babies. Mixed with a bit of Breast Milk or Formula, this is usually a baby's very first solid food. Once babies are doing well with rice cereal, they can move onto other single grains, such as oatmeal or barley cereals. Vegetables, fruits and meats will be added gradually, with meat typically being last. 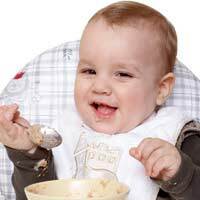 While babies vary in appetite, most are satisfied with one small meal (just a few spoonfuls) per day for the first week or so. After that, many take two meals daily and within a few months are eating three times each day. Babies, like the rest of us, can get bored with their meals if they are offered the same things over and over. Additionally, the best way to be sure that babies get all of the nutrients required for healthy growth and development is to feed them a varied diet of simple, healthy foods. After cereal, fruit and vegetable purees are often recommended. Some parents prefer to introduce vegetables first, believing that their babies may not be willing to eat vegetables if they are first offered the sweetness of fruit. Others offer fruit first and some go back and forth. Any of these methods is fine, just as long as new foods are introduced individually so that parents can be certain that their baby doesn't have an adverse reaction to a particular food. Homemade or Shop Bought Baby Food? While the convenience of commercially prepared baby food is appealing, many parents prefer to prepare their baby's food from scratch. This is perfectly acceptable, but a baby's diet shouldn't contain any added sugar, salt, or other seasonings. When choosing to puree fruits and vegetables at home, simply steam or boil the foods until soft and then add a bit of breast milk, formula or plain water to get a smooth consistency. While many babies enjoy their meals warmed, be careful not to serve foods that are too hot. Babies are much more sensitive to heat than older children and adults, so warm their foods just until the chill is removed. As babies grow and their teeth begin to emerge, many enjoy foods that are a bit chunky and most are enthusiastic about beginning to self-feed. This is an important developmental milestone, but parents must be alert while their babies are eating so that the baby doesn't choke. Never serve small children any foods that are hard and round since these are common choking hazards. Grapes, cherry tomatoes, and chunks of meat are all examples of foods to avoid. Also, babies tend to overstuff their mouths, so parents must be careful to only put a few pieces on the highchair tray at a time. Babies are learning new things everyday. When they are first eating solid foods, babies will learn to enjoy the foods that their parents choose. Because of this, it is important to begin establishing healthy eating habits right away. Never offer babies "junk" food or sweets. At this stage, they have no desire for these foods and it is best not to encourage a taste for them. Babies and young children have small tummies and can only take in a small amount of food each day – it is up to parents to assure that the food their babies consume is appropriate and nutritious. Enjoy Food as a Family! Mealtimes are often fun for families, providing time for everyone to gather and share the details of their day. While babies certainly cannot contribute much to the dinner conversation at first, it won't be long before they are taking part. If possible, seat your baby at the table with the rest of the family and try to schedule baby's meals to coincide with those of everyone else. In today's busy world, establishing at least one family meal time daily allows everyone time to stay connected. In our article Food Allergies in Babies find how to recognise the symptoms, what are common allergens, and when you should seek medical treatment for your child.